In general, I try to steer clear of current events on this blog - it's my refuge. In my daily life, I work and think about things that one might refer to as "heavy". My blog gives me an opportunity to escape and maintain some semblance of calm in otherwise hectic and serious times, especially right now. 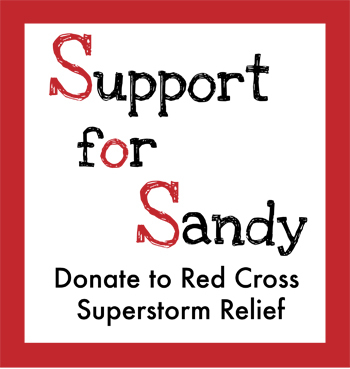 That being said, a few folks that I like very much and respect a whole lot have started efforts to support the survivors of superstorm Sandy and I want to support them and the work they are doing. Jenn of Jenn Cuisine has asked that today, us food bloggers out there share a comforting dish we would make for those in need and encourage our readers to support the relief efforts. The link in the image above will take you to a donations page for the Red Cross. But I would also encourage you to review this great comprehensive page on volunteering and donating responsibly - it contains oodles of links for different states and organizations. Erin from Gluten-Free Fun has also been spear heading a movement to help with gluten free donations, so please visit her blog for ways to help those folks. In a few weeks or so, Joy of Frock Files will be setting up an Etsy Shop to sell handmade goods created by various artisans to raise funds. I encourage you to do what you can, when you can, in whatever way works most appropriately for you. At the very least, please consider taking a moment to think about if you and your family are prepared for a disaster. We're all vulnerable, whether we like to admit it or not, so take action and prepare yourself as best you can. Ready.gov is a great place to get started with building your own personal disaster plan and kit - and to find ways to stay informed. And now back to comfort and food. Recently, my go to comfort food dish has been a dutch baby that's totally loaded down with blueberries. It's warm, filling, and bursting with blueberry deliciousness; sure to bring at least a small bit of comfort to those in need. In a medium bowl, combine the eggs, almond milk, flour mix, and flaxseed. Mix with an electric mixer until smooth. Place the stick of butter in a 10 inch cast iron skillet and set in the oven. After about 5 minutes or however long until the butter has melted, carefully remove the pan from the oven. Gently pour the batter into the pan and sprinkle with the blueberries. Bake for about 40 minutes or until the outer edges have risen and browned. The center should be fairly sturdy as well. Serve with a sprinkle of powdered sugar. Makes 2 large servings or 4 small ones.